TRIVIA of Noh : Q113 :Where does the sliding walk in the Noh performance come from? | Home | Trivia | Q113 : Where does the sliding walk in the Noh performance come from? Where does the sliding walk in the Noh performance come from? Some say the sliding walk of Noh came from "uho," which was practiced in ancient China, although nobody knows exactly what "uho" was like. In classical writings, there are some references to "ai-sakusezu" which means "stand straight before stepping forward without lifting one foot in front of the other." You can see similar steps in Ranbyōshi (a highlight scene in "Dōjōji"). It is said that "uho" originates from the walking style of a saintly king called U in an ancient legend. To push embankment work forward, U spent all his time walking in mountains and valleys, which eventually made him go lame. It is believed that because of this he had to walk in a specific way, dragging his feet. There is a characteristic step called "henbai" in modern kagura (sacred Shintō music and dance) and dengaku (Japanese ritual music and dance performed in shrines and temples). Employed to revive the earth and to pray for a good harvest, the step is said to be a descendant of uho. 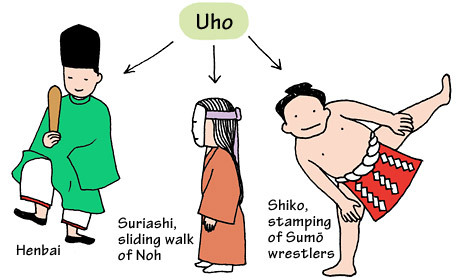 Some say the stamping of wrestlers in the sumō ring also came from uho.